Willpower Begins the Journey But Discipline Helps You Stay on the Path! It’s been some time since my last post and the many reasons fill my head now as just excuses. But time is of the essence, it’s fleeting, and there are just 24 hours in a day. The business is flourishing, and I’m writing curriculum which takes the place of writing about my health challenges…practices. Time is incremental when I look at the health of both us…myself and my husband. My health is like a rollercoaster lately running the gamut of hills and valleys – sunny days and cloudy disparity. While my husband turned his willpower into the discipline he needed to stay on the path. Willpower, is it a power of wills? Is it a will of power? Do you have control of your will? Dictionary. com says willpower is the control of one’s impulses and will. Well, what it doesn’t say is that my husband has an abundance of it when he finally makes up his mind to do or not do something. Dictionary.com says this about discipline. It’s a training, activity or a regimen that develops or improves a skill. Well, this explains a lot of why the two nouns go together. You have to possess the willpower to discipline yourself so you can improve your life or a part of your life. So what’s the point of talking about willpower and discipline? You see, back in January of 2017 my husband had bilateral pulmonary embolisms, his left leg had a blood clot from his ankle to his groin. The doctors at the hospital told us how lucky he was because normally they don’t give this diagnoses to men over 50 – they find it in an autopsy. So, yes, he was lucky, but I liked to think that he was blessed. Over the last year and a half, we changed diets, we changed lifestyle and we changed our health outlook. My husband spent only 6 months on the meds and with my research help and finding the right naturopath he transitioned to supplements. But he had a strange inflammation issue in his left leg that would worsen if he moved or sat still. Nothing would work long term. Diuretics (prescription and natural) only work when you’re taking them, they don’t address the cause of the inflammation. So back to the research I went. About three months ago, my research took me to a place I never thought about, but wow it’s changed our lives. Health research more precise alternative health research is my forte, in being a holistic life coach. I had exhausted every avenue I knew but I was coming up short on answers. I remember it was about 2 a.m. one morning back in March, I laid it all out on my desk before God and asked God to direct me. I got an answer three days later when my husband was talking to our friend who’s a doctor. “Have you looked into the lymph system?” I had never thought about that. I was thinking food allergies, side effects of the meds, scar tissue from the damaged veins, wrong exercises, not enough exercising, etc. We have more lymph fluid in our bodies than we do blood. And the lymph nodes in our abdomen area control the lymph movement in our legs. The lymph nodes in our neck control the lymph movement in our chest and arms. (Organic Lifestyle Magazine) This is fascinating stuff to me, and I’m talking about it constantly to my husband but, as is his usual, he just wants the cliff notes. To make a long story shorter, I found a lymph cleanse for my husband to do. I used my knowledge of intermittent fasting and combined a raw, plant-based, high-fat, low-carb, low protein, alkaline plan to help my husband lose the inflammation. He also ate one huge salad every day made with alkaline veggies especially the red ones: beets, red cabbage, red carrots (nightshades excluded because they cause inflammation). I make salad dressings for him with avocado oil, garlic, cucumbers, ginger, blackberries, lemon juice, avocados and Himalayan salt. The calorie count during this the first two weeks was 300 and 400 calories every day. During the third week, we added a veggie smoothie to his huge salad. 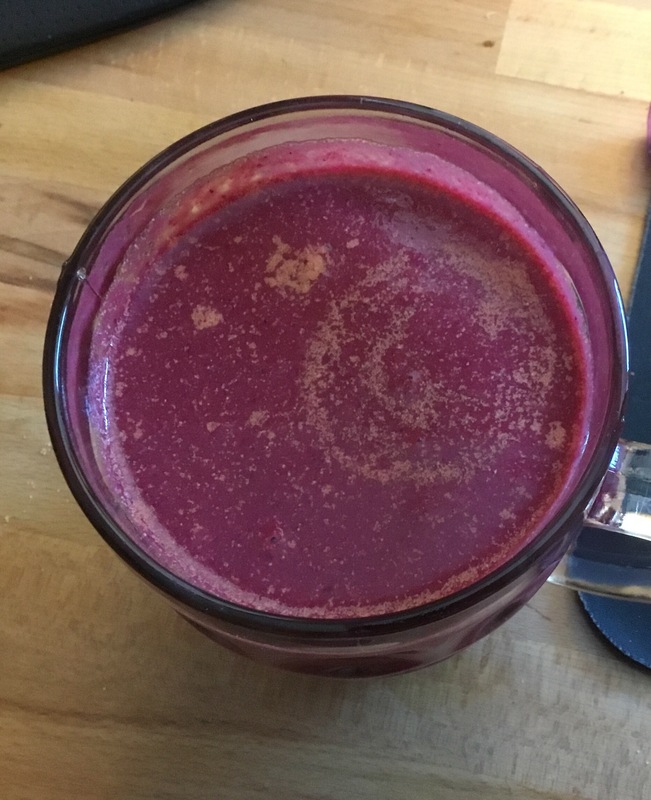 It was filled with full-fat coconut milk (no gums added), kale, carrots, beets, celery, avocado, cucumbers, cherries, blackberries, raspberries, and strawberries (I would alternate the fruit for him), maca powder, our favorite raw vegan protein powder (Sunwarrior’s Warrior Blend has no sugar, soy, or grains in it, it’s raw and it’s our favorite) and some water. We added raw organic nuts but only the high fat, low carb, and low protein varieties: macadamias, pecans, and walnuts. We also added coconut oil fat bombs. I make my own with coconut oil, coconut butter, sunflower butter, maca powder, and carob (recipe below) which my husband calls fudge chunks because of their texture. 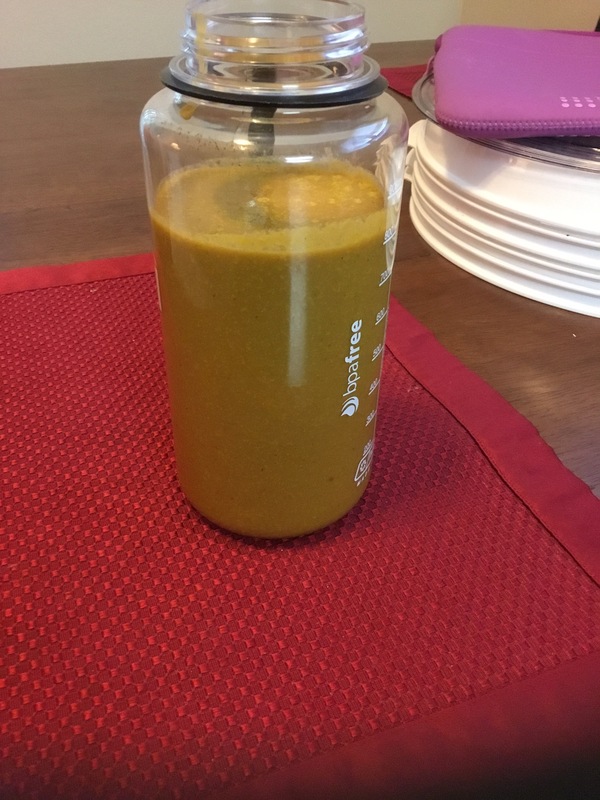 Coconut Mama has a pretty good recipe that I started with and then started tweaking to make my own recipe with ingredients we can eat. And he continues this plan now at the 8-week mark. As you can see he doesn’t eat much only about 600 – 800 calories a day. He cut out all sugar even high sugar fruits and veggies. He doesn’t eat any grains. He eats all raw veggies, nothing steamed. He drinks a gallon of lemon water daily. He walks about 3 miles a day and does about 50 squats a day (squats are great at getting our lymph fluid moving). He also spends time on his spinning bike when it’s raining out. He doesn’t get overheated anymore. He had an issue since he was a teenager (he was a runner and very fit then) where he would overheat when the temps rose above 70. It was 87 degrees a couple of weeks ago and he was fine, even had on a long sleeve shirt. His recovery time from hikes and workouts is getting shorter and shorter. As a landscape photographer, he hikes all over the place on different types of terrain. His first hike of the season was last week where the grade was steep at 19%. Yes, he was sore and what used to take 3 – 4 days to recover only took 24 hours. This plan is a cleanse that will clean up your lymph system and your whole body. It will balance your hormones. It will reset you on a health journey by cleaning out the toxins that not only clogged your arteries but your life. This plan is not for the faint of heart. If you don’t have the willpower to start and the discipline to say “NO” to food that’s sitting right in front of you or all around you at your office and social gatherings then it’s not for you. It’s not for everyone. But, if you are at the end of your rope, and you need to make a change that’s going to save the quality of your life, then you may want to take a look at some of the links I’ve posted above. My husband’s willpower led him to say yes to this journey but it’s his discipline that keeps getting stronger every time he says “NO” to food that’s not right for him. He can say yes to these! Melt the coconut oil and butters in a small saucepan over very low heat. You only want to melt it without boiling it. Stirring till melted. When totally melted, immediately remove from heat. Let it sit for a couple of minutes to cool. Then add the vanilla, almond extract, and stevia. Whisk till blended. While whisking, add in the carob powder, salt, and maca powder. Whisk until smooth and incorporated. Pour into a 2-cup glass measuring cup for easy pouring. Pour into small candy molds or a mini muffin pan with paper liners. Only pour to about 1/4 to 1/3 full. Refrigerate about two hours to set. Remove from molds or pan (I removed the paper liners.) These can be stored on the counter or in the fridge. Makes 20 pieces of fudge. Five years ago, when I started blogging for a class project in college, I had an agenda for every day of the week. Yes, I wrote a blog post every day. But I only had school and blogging, no job in site then. Fast forward to now, I have a full time job, I have several entrepreneurial adventures, and I am writing a book about The 50 Day Cleanse. So writing a blog post every day keeps me awake in the wee hours of the morning. Even though this is the case today, I still think having a theme for my days will help me as the blogger and you as the reader. Today is 5 Tip Friday. 1. Before you start the 5-day water fast, clean out your kitchen. Throw out all the opened processed foods in your fridge and pantry. If some items are unopened, give them to a food bank. Remember that you will be transitioning to a raw, alkaline, high fat vegan eating plan. You’ll be replenishing your kitchen with high alkaline veggies, fats, raw unsalted nuts and seeds, and low sugar fruit such as berries, lemons, and limes. 2. Buy some Himalayan salt rocks, a glass jar with glass lid, plastic or wooden measuring teaspoon, and Fiji water. Make the solution for the Himalayan Sole Water. This water will help you get through the 5 days and beyond. It contains all 84 minerals our bodies need in the precise amounts our bodies need. You’ll only be taking a teaspoon of the solution in more spring water. It’s pretty cheap to make, too. I bought a 5 pound bag of the Himalayan salt rocks three years for $25 and I am still using the same solution and rocks, just adding more rocks one at a time and filling with water, when needed. 3. You’ll also need either a juicer or extractor. I like my NutriBullet Pro. But there are many on the market to choose from. Find one that works for you. 4. Stock up spring water, reverse osmosis water, distilled water, or if you have a kangen water system that’s fine, too. You’re going to be drinking half your body weight in ounces of water each day throughout this cleanse! 5. Since you won’t be spending so much time in the kitchen, you might want to start a new hobby, or creative outlet to get your mind off of thinking about food. Reading books help. Bonus Tip: Try to rearrange your schedule so you are fasting on your days off from work for at least the second and third day. Why? Because these are the days that can have a big healing crisis on them (headaches, nausea, body aches, flu like symptoms, dizziness, and the like). 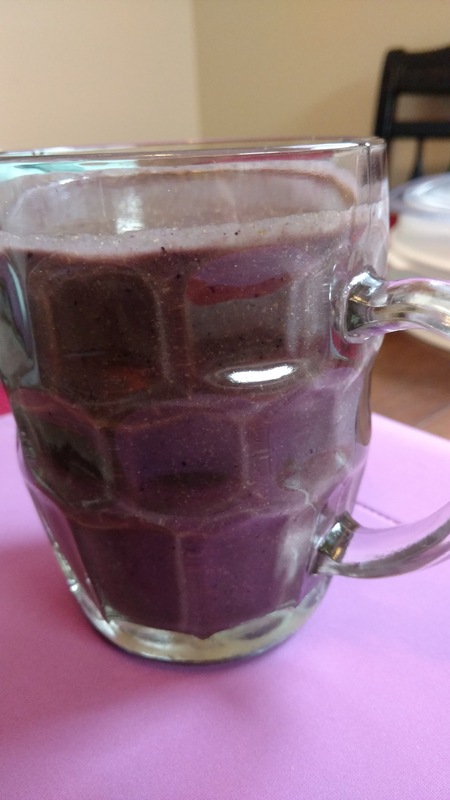 I made this smoothie this week and it’s now become one of my favorites! 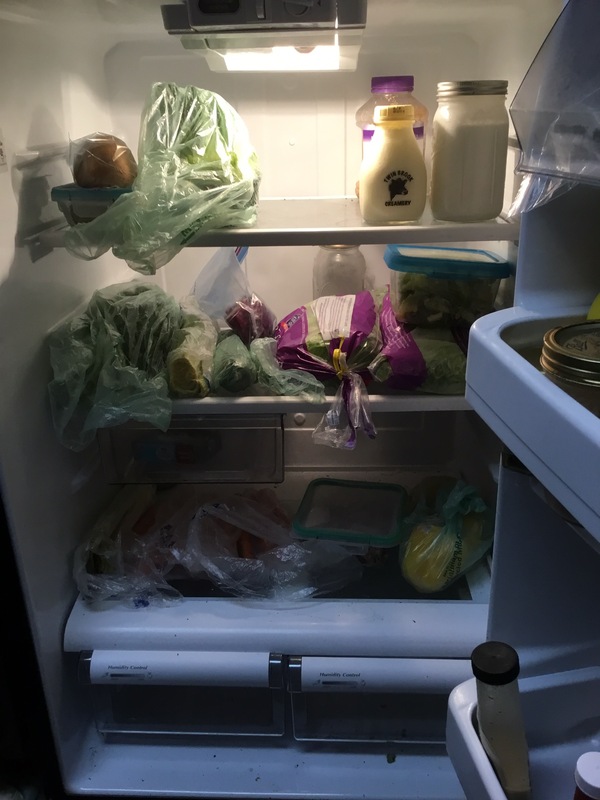 Over the weekend, I was asked, “What’s in your fridge?” Many people have asked me what we eat when we’re not fasting. Like we eat exotic foods or we have sparse meals. We don’t eat exotic, outlandish, or even costly meals. Salads don’t cost much and because we’ve been doing the intermittent fasting cycle on a regular basis, we’re not as hungry as we used to be. This is my moment of truth. 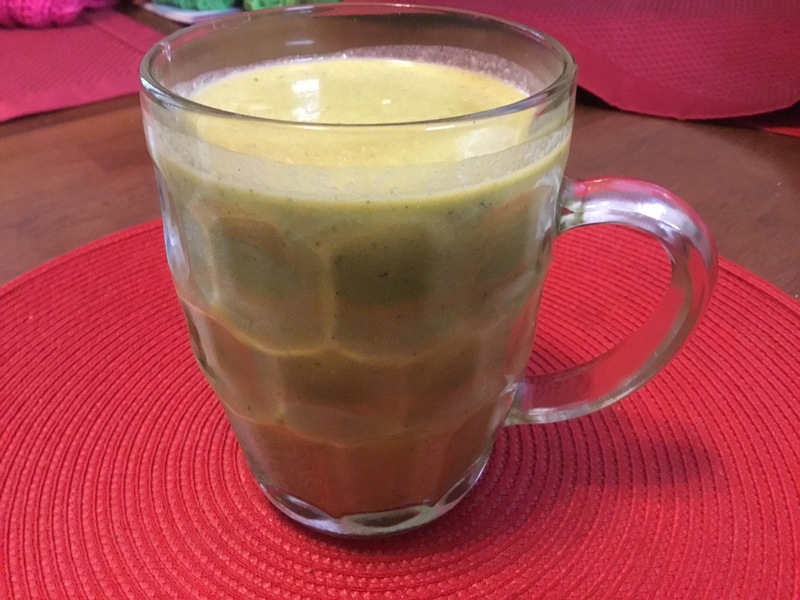 It’s always a raw, alkaline veggie smoothie because it starts our bodies off in an alkaline state. Then an hour later I have a cup of vegan high fat coffee or tea. I depends on what I’m in the mood for. High fat coffee? What’s that? I add 1 Tablespoon of coconut oil and two tablespoons of real coconut cream (only ingredient is coconut). My last meal of the day is usually a salad, but sometimes I will make some raw sunflower sweet potato taco meat and make wraps with lettuce leaves. I really like my White Gaspacho, too. 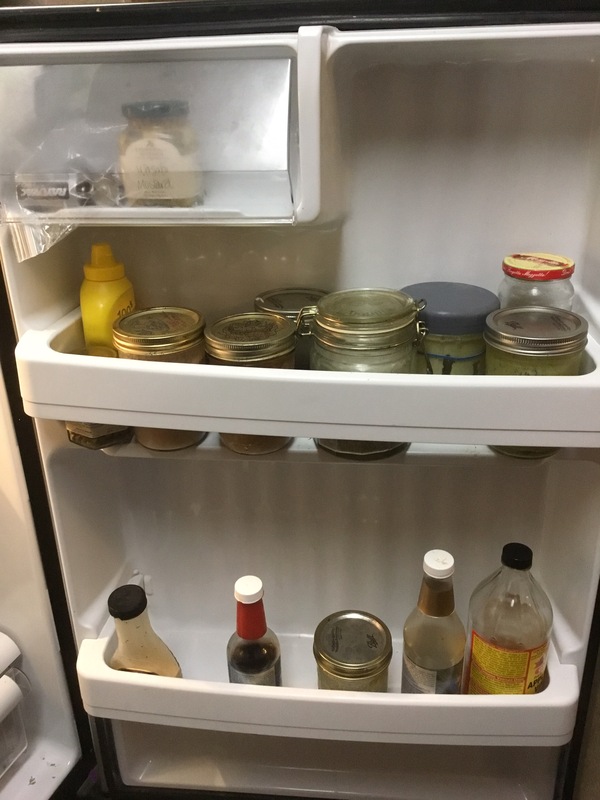 Your challenge Please post what’s in your fridge. We all need that moment of truth. 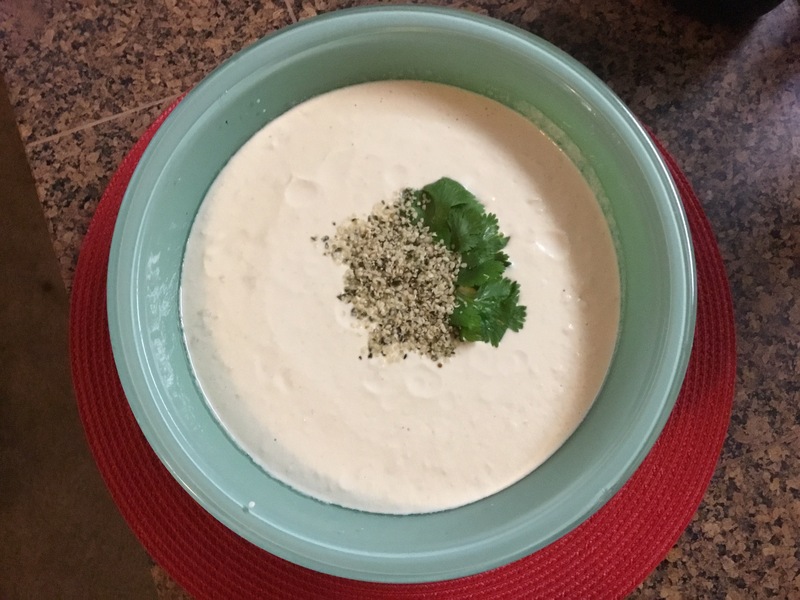 I love the challenge of coming up with a raw, alkaline, vegan alternative to my favorite recipes. Ajo Blanco is another of my favorite recipes. It’s a White Gazpacho made with white bread cubes and milk along with grapes and apples. I used to love the taste of it…until I was diagnosed with Celiacs disease. I’ve tried making it with gluten free bread but it never really tasted the same. So, banished to the back of my cookbook file only to come out when I could try it yet again. And now it not only magically appears on the front page of my file, I’ve made it twice and both times got rave reviews. Whirl together in a high-speed blender. This will last about 2 days in the fridge. I have been decluttering every area of my life from my living space to my work habits, from my social media presence to my simplistic existence, and it’s taught me what’s really important in life! All this decluttering has led me to downsize my cookbook collection. This year I gave cookbooks away as Father’s Day gifts to my sons along with a pound of unique coffee that represented their personality. But the ones I’ve saved I vowed myself to go through and Raw Up my favorite recipes within those pages and make them raw alkaline vegan for the 50 Day Cleanse and beyond. 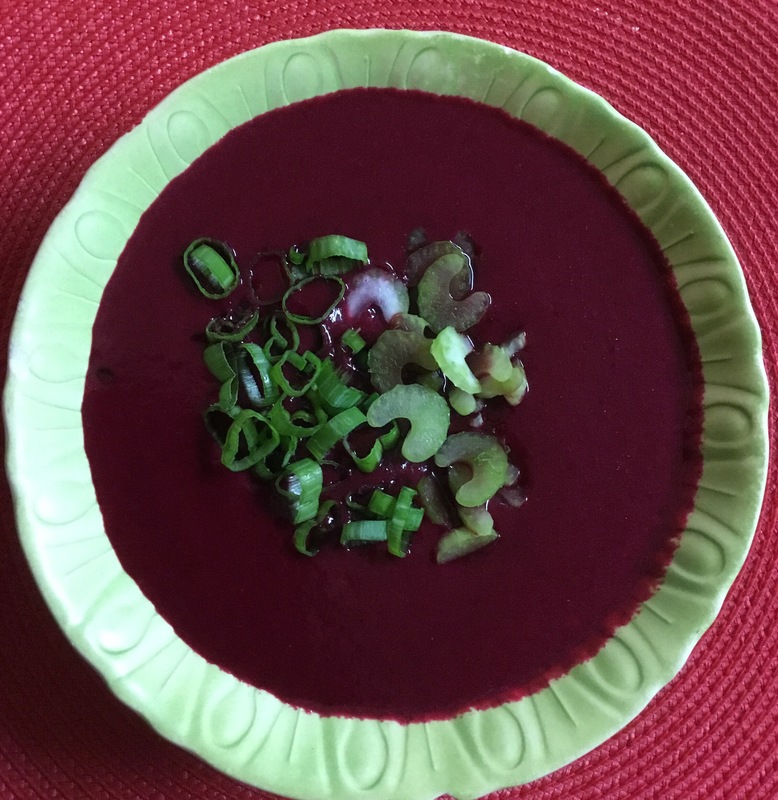 Velvety Beet Soup is the first one. Whirl first 7 ingredients in a high powered blender or nutribullet. Mix together, store in glass jar for six months. Variation: Add a dollop of cashew sauce over the top and sprinkle on a bit more spice for heat.